Days of Our Lives (DOOL) spoilers for the next two weeks tease that major revelations are on the way. The week of October 30-November 3 will deliver some stunning moments in Memphis. After Sami (Alison Sweeney) gets herself arrested again, she’ll find more clues that put her on the path to the truth. Sonny (Freddie Smith) will also end up in the hospital as the stress takes a toll. Days spoilers say Paul (Christopher Sean) will worry about what this search is doing to him. Sonny is understandably obsessed with finding Will (Chandler Massey), but his health is suffering because of it. On Halloween, we’ll get a break from the usual drama. Things will take a creepy turn with some twisted fantasies. True O’Brien will reprise her role as Paige and Melissa Archer will be back as Serena. 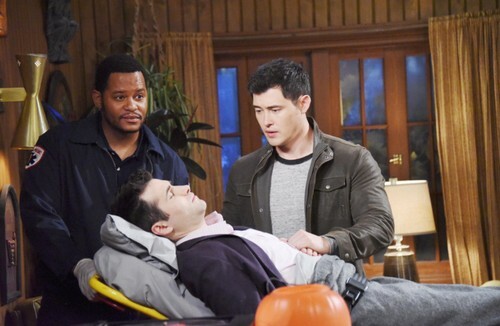 DOOL viewers will see Dr. Rolf (William Utay) and Ben (Robert Scott Wilson) pop up again as well. Later, Days will get back to the action. John (Drake Hogestyn), Marlena (Deidre Hall) and Sami will all have a fierce faceoff with Susan Banks (Eileen Davidson). She’ll reveal some shocking news, so they’ll be one step closer to reuniting with Will. However, Paul might beat them to it. It appears he may see Will somewhere and keep quiet about it. That’s sure to cause serious issues with Sonny later! In the meantime, Eve (Kassie DePaiva) will explain how and why she’s Deimos’ (Vincent Irizarry) widow. She’ll have even more bombs to drop during the week of November 6-10. Victor (John Aniston) and Brady (Eric Martsolf) won’t be pleased by all the changes Eve brings to town. Since Brady is feeling pretty ruthless these days, he’ll come up with a scheme to take Eve down. Of course, that also sounds like a classic setup for hatred turning to love. DOOL fans need to keep an eye on those two. Elsewhere, Theo (Kyler Pettis) will try to figure out who’s behind DiMera Enterprises’ sabotage. He’ll make progress and pass along some new info to Kate (Lauren Koslow). She’ll be glad the investigation is paying off, but she’ll push Theo to keep at it. Kate needs to know who’s behind this ASAP! Unfortunately, DiMera’s problems may not even be on Theo’s radar soon. Days of Our Lives spoilers hint that his life is about to be derailed. Word has it JJ (Casey Moss) will shoot and paralyze Theo during some type of showdown. Salem will be divided as JJ and Theo face the toughest ordeals of their lives. It looks like some gripping episodes are coming up. We’ll give you updates as other Days of Our Lives details emerge. Stay tuned to the NBC soap and don’t forget to check CDL often for the latest Days of Our Lives spoilers, updates and news.